Grunau Company Helps Build a Better Milwaukee | Grunau Company, Inc.
Grunau Company was selected by the general contractor team of Gilbane | C.G. Schmidt Inc. to provide mechanical contracting services for The Northwestern Mutual Tower and Commons being built in downtown Milwaukee. Grunau is providing HVAC and plumbing as well as specialty metal fabrication services for the facilities, which will include a 32-story office tower and three-story common space totaling more than 1.1 million square feet under one roof. The Tower and Commons is sited alongside the city’s lakefront, next to a signature building on Wisconsin Avenue that is being incorporated into the final design. The development will feature a 4.6-acre outdoor public space with gardens, walkways and sitting areas. The Commons will be open to the public. Grunau employees and its subcontractors are working alongside scores of other companies on the project. 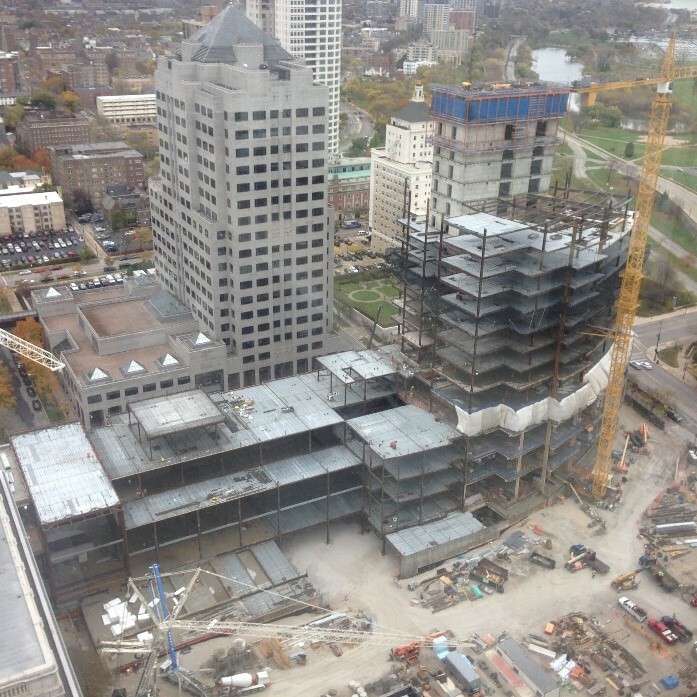 Northwestern Mutual has committed to use small business enterprises for at least 25 percent of the construction cost and Milwaukee residents, through the city’s Residents Preference Program, for 40 percent of the labor hours on the project. Grunau is working toward following this requirement and contributing to the community-based development. “The opportunity to work on a project like this for these smaller businesses will hopefully prove invaluable. We take pride in mentoring both the small business employers as well as their employees to better help their organizations grow.” Selas says. Construction is expected to be completed in late 2017.